This December marks A Cappella’s 25th anniversary in Atlanta, and we’re celebrating in the best way that we can think of: with a book! We’re publishing a collection by 25 (mostly) Atlanta writers on their own experiences with and thoughts about books and bookstores. Pulitzer Prize winner Hank Klibanoff, The Southern Foodways Alliance’s John T. Edge, Atlanta favorite Hollis Gillespie, Townsend Prize Winner Thomas Mullen, Lillian Smith Award winner Anthony Grooms and other local notables including Susan Rebecca White, Jessica Handler, and Charles McNair are among the authors featured in the book. On Friday, December 5 beginning at 6 p.m. we’re throwing a book release party and anniversary celebration at two locations where we have enjoyed many of the most exciting times in our history. Festivities begin at the Jimmy Carter Presidential Library, where a number of the contributing writers will be on hand to sign the new book as well as their own titles. Afterwards, we head to Manuel’s Tavern for food and drinks, trading stories from the past quarter century and looking ahead to what may come. Join us at Village Books in welcoming John T. Edge for his book The Truck Food Cookbook. John T. will not only be talking about his new book, but he'll lead a discussion with a few Bellingham food cart owners. Learn about what it takes to run a food truck, with first-hand stories from James, owner of StrEAT Food, and Keith & Vicki, owners of Roll'n Smoke Barbeque. John T. Edge, a five-time James Beard Award nominee, writes the monthly "United Tastes" for The New York Times. 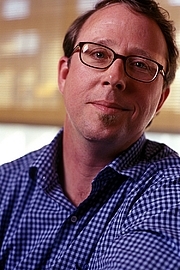 His work for Saveur and other magazines has been featured in seven editions of the Best Food Writing compilations. He runs the Southern Foodways Alliance at the University of Mississippi. His last book was Algonquin's Southern Belly: The Ultimate Food Lover's Companion to the South. Mr. Edge lives with his wife and son in Oxford, Mississippi. It's the best of street food: bold, delicious, surprising, over-the-top goodness to eat on the run. And the best part is now you can make it at home. Obsessively researched by food authority John T. Edge, The Truck Food Cookbook delivers 150 recipes from America's best restaurants on wheels, from L.A. and New York to the truck food scenes in Portland, Austin, Minneapolis, and more.John T. Edge shares the recipes, special tips, and techniques. And what a menu-board: Tamarind-Glazed Fried Chicken Drummettes. Kalbi Beef Sliders. Porchetta. The lily-gilding Grilled Cheese Cheeseburger. A whole chapter's worth of tacos--Mexican, Korean, Chinese fusion. Plus sweets, from Sweet Potato Cupcakes to an easy-to-make Cheater Soft-Serve Ice Cream. Hundreds of full-color photographs capture the lively street food gestalt and its hip and funky aesthetic, making this both an insider's cookbook and a document of the hottest trend in American food. John T. Edge discusses The Southern Foodways Alliance Community Cookbook. John T. Edge discusses Cornbread Nation 5. John T. Edge is currently considered a "single author." If one or more works are by a distinct, homonymous authors, go ahead and split the author. John T. Edge is composed of 4 names. You can examine and separate out names.